The 19th Century spa town Saint-Gervais is the only resort in the Alps to combine the pleasures of skiing and other snow activities with those of health and beauty spa treatments. It is also an ideal base for exploring the resorts of Mont Blanc region. The 4810m summit of Mont Blanc rises on the communal territory of Saint Gervais. The village thus disposes of the most extreme difference in altitude in Europe: from 580 to 4810 metres. From hiking to mountaineering, the natural decor of Saint Gervais offers numerous walking possibilities between villages and eternal snow. 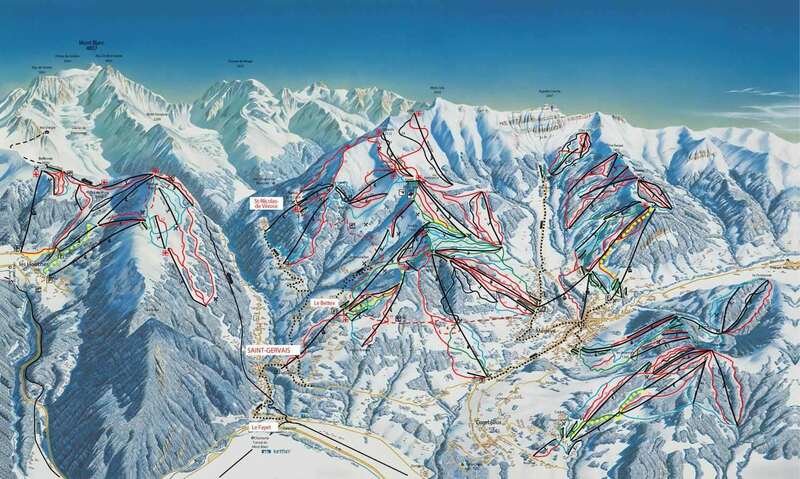 The Evasion Mont-Blanc ski pass covers the large area of Saint Gervais, Saint Nicolas de VÃ©roce, MegÃ¨ve and Combloux and also includes the slopes at Les Contamines-Montjoie and Les Houches (access by the Mont Blanc Tramway). All areas are easily accessible, for beginners to advanced skiers. The highest train in France awaits you for a wonderful trip to the foot of Mont Blanc. In winter it takes skiers and walkers to the Bellevue Plateau (1 800 m) and Prarion Ski Area, at the heart of an exceptional panorama. Other activities include a spa centre, ice rink, indoor swimming pool, snow scooters, snowshoeing, paragliding and cinema. Apres ski is lively and there is a choice of restaurants and bars, but for a wilder time head up to Megeve. Great place snow not good on all slopes , think I would return because it has great runs for intermediate skiers but it needs more snow this year.